The Polsen CAM-2WC is a 2-channel wireless microphone system that is designed for hands-free mobility in a wide variety of applications including video production, electronic news gathering (ENG), electronic field productions (EFP), and classroom and presentation applications. It is a reliable, easy-to-use solution for wireless sound transmission. The CAM-2WC includes a cardioid microphone (PL-2WC), which is ideal for video applications where background noise can be problematic such as trade show floors or sporting events. It is also good for live presentation applications, such as lectures, since cardioid microphones are less susceptible to feedback. The CAM-2WC system was designed with two switchable frequencies to avoid interference while operating at a range of up to 100 feet (300 feet in optimal conditions). A durable and flexible antenna that can be positioned for the best possible reception is included. Audio can be monitored in real time with the included earphone. A tie clip for wardrobe placement and a windscreen that reduces wind noise and vocal plosives are also included. The CAM-2WC system is a compander-free system for delivering high-quality audio. In most wireless systems, the audio signal is compressed in the transmitter and then expanded in the receiver causing undesirable artifacts such as pumping and breathing. Compander-free systems don't exhibit these artifacts making them a favored solution among filmmakers around the world. The CAM-2WC system is quick to set up and easy to use. 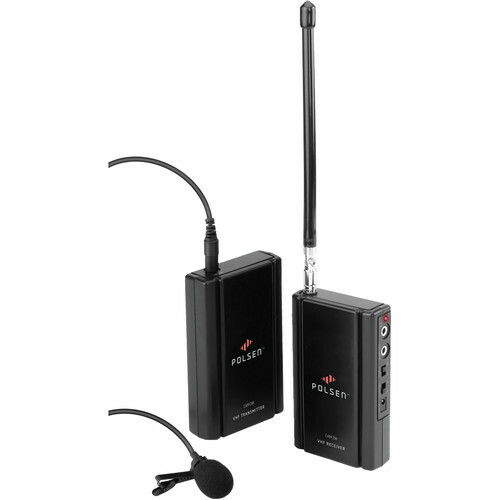 Everything needed for high-quality audio transmission is in the box including lavalier microphone, earphone, and an audio cable to connect directly to a DSLR camera or camcorder. The system operates without compressing audio prior to transmission, and expanding it again at the receiving end. This compander-free system eliminates audio artifacts such as pumping and breathing, and assures the delivery of high-quality audio. The system has two switchable frequencies to avoid Radio Frequency (RF) interference caused by other electronic devices sharing the same frequency. Changing frequencies is as easy as switching the channel selector switch to the A or B setting. Each model (G1, G2, G3, or G4) operates in a different frequency range. The receiver can be mounted onto a standard shoe mount of a DSLR or video camera, or can be attached with a belt clip, providing a variety of recording and monitoring options. Weighing approximately 3 ounces, the transmitter can be easily concealed on a subject by attaching it with the included belt clip, or placing it in a pocket. The CAM-2WC includes the PL-2WC cardioid microphone, which is ideal for presentation applications because it rejects off-axis sound like room noise. The included earphone can be attached to the Phone Out jack of the receiver for real-time monitoring of the signal from the transmitter. This feature can be used to monitor the signal at the receiver, and can also be used for stage directions and cuing. The system has an operating range of 100 feet (30.5 m) (300 feet in optimal conditions) giving operators a wide variety of options for shooting and recording. The durable and flexible antenna on the receiver is adjustable and can be positioned for optimum reception even if the camera is pointing in a different direction than the sound source. The transmitter and receiver each operate on a single 9V battery that provides approximately 8 hours of normal operation. The receiver includes a 9V DC power input jack for operation with a 9V power adapter (not included). Simultaneous use of more than one CAM-2W/2WC transmitter/receiver pair in the same vicinity is possible by purchasing sets that rely on slightly different frequencies. They're identified on the model sticker located on the back of the box as G1, G2, G3, or G4. By using correctly matched units, four wireless pairs can be deployed at once. Box Dimensions (LxWxH) 9.843 x 5.669 x 2.284"
CAM-2WC - Camera-Mountable VHF Wireless System with Cardioid Lavalier Mic (G1 Band) is rated 3.8 out of 5 by 9. Rated 2 out of 5 by Vanderb from Keep looking I've had this mic for over a year now and it doesn't work for me. I shoot videos for YouTube and our website mostly. They're always outside demo videos and usually in the woods. I end up shooting about 5 videos to get one with good sound quality. I'm typically about 15 feet from my camera and the feedback from this mic is ridiculous. The static is so bad that you can't hear my voice. I've tried both channels, putting the transmitter in my front, back and side pocket as well as clipping it to my belt. No matter what I do the is always static...I just have to settle for the video with the least amount of static, but none ever really sound good. Maybe if your sitting totally still right in front of your camera this mic works, but it doesn't work for my needs. Rated 4 out of 5 by ChivalryPro from Great starter Audio System for DSLR My work previously had been hampered by not being able to record audio at a distance and the prices of many systems wasn't an option for a starting business. Then I found the CAM-2WC. This is a an affordable yet versatile system that's really helped. I've experienced no problems with signal loss or interference. The only challenge I'm finding is without an audio control on my headphone, the level coming out of the headphone jack is uncomfortably loud. A small price to pay for non-wired audio support. Rated 2 out of 5 by LRC from Signal is Not Strong Enough The audio started getting static if the mike was 25 feet away in direct sight of the camera/receiver. By 30 ft the static was bad. It was worse if the pack was at my back and I was facing the camera. By 40 ft it was completely inaudible. The cardio mike still picked up ambient sounds and was large. I need greater range. I am returning it. Rated 4 out of 5 by Lost Tiger from Great moderately priced Sound recording This moderately priced VHF wireless system with Mic is perfect for the amateur and budding pro alike. Simple to use and easy to pack. It really adds a whole new level to your recordings when you have HQ sound rather that the cheap onboard mic. I would recommend this to anyone. Rated 5 out of 5 by Joe the cameraman from Check your batteries Initially I wasn't impressed with the performance but that was due to old batteries. Fitted fresh alkalines and was very surprised withe range. Set it up inside a wooden house and walked three houses down the road before it dropped out. Rated 4 out of 5 by WNC Sherpa from OK for economy solution I bought this mic to do some YouTube videos and just wanted something a step up from the mic on my Nikon D3200. It won't get a ton of use and most of my videos are shot outdoors in remote wilderness type areas so I opted for the one with just 2 channels. Its very straight forward and quick and easy to set up and use. I like the fact that it comes with an ear bud so that the recorder can listen to sound quality in real time. I was disappointed with the range on the transmitter. I first started trying to use it with transmitter in my back pocket while standing at a range of about 20 feet. There was so much interference (heard in the supplied ear bud) that we stopped recording. When I moved the transmitter to my front pocket the interference decreased, but never totally went away. It has a static sound and the further you move from the receiver the worse it gets. I think it is supposed to be good to 100 feet, but there is no way that would work on the shoot that I did. Overall it is a reasonably good solution at a value price and with some post-processing should work fine for my needs. Rated 4 out of 5 by Ian from Decent quality So far no complaints other than a large form factor on the mic itself and a slightly more hollow sound than I'd typically like for professional recording. How is this different than the more expensive Polsen CAM-2W? The difference between the two systems is the type of microphone that is included. This system has a cardioid lavalier, while the CAM-2W includes an omnidirectional lavalier mic. What size windscreen to I need for the mic that comes with this? The suggested 1/4 size we ordered under Accessories tab were too big. This is another brand that may be a better fit. But 1/4 should fit. Can you use more then one mike with this? There should be no reason why it will not accept multiple mikes as long as they are all on the same frequency.